In 1964, Henri-Georges Clouzot chose Romy Schneider and Serge Reggiani, as the lead actors of L'Enfer (Inferno). This enigmatic and original project, about a hotel manager who becomes possessed by the demons of jealousy, was given an unlimited budget and touted to be the cinematographic event of the decade. However, three weeks into filming, drama unfolds and the project aborted. The images, said to be incredible, were never shown. Decades later, having uncovered some of the original rushes and screen tests, directors Serge Bromberg and Ruxandra Medrea have succeeded in recreating a new film from the remnants and brought it to fruition. 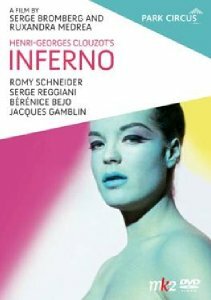 Part original, part documentary and part reconstruction, Henri-Georges Clouzot's Inferno shows L'Enfer as it was shot, and tells the emotional story of an ill-fated film project and of Henri-Georges Clouzot, who had been given free rein to his filmmaking genius.